I am a newbie here and I was wondering if you could provide an example of how to read the data contents of a packet using visual basic syntax. Also is the data in the packet the same as it would be if I were to view the contents at the winsock level. I want to get the source IP and Port and then view the data to determine whether to drop the packet or not, is that possible with WinPKFilter samples? I am a newbie here and I was wondering if you could provide an example of how to read the data contents of a packet using visual basic syntax. Regretfully I’m not a VB expert, but parsing Ethernet header is shown in the VB samples. You can parse follow up headers (IP, TCP/UDP) just on the same way. Also is the data in the packet the same as it would be if I were to view the contents at the winsock level. On WINSOCK level you work mostly with data streams (no packet headers), here you got packets with Ethernet, IP headers and etc… But packet payload contains the data you seen on winsock layer. You can parse follow up headers (IP, TCP/UDP) just on the same way. I am a newbie with all of this so sorry if this is a stupid question! The IP and TCP headers are all contained in the same packet right? What are the sizes of the IP header and TCP header? Does the data/payload section always follow the TCP header? The IP and TCP headers are all contained in the same packet right? What are the sizes of the IP header and TCP header? Does the data/payload section always follow the TCP header? 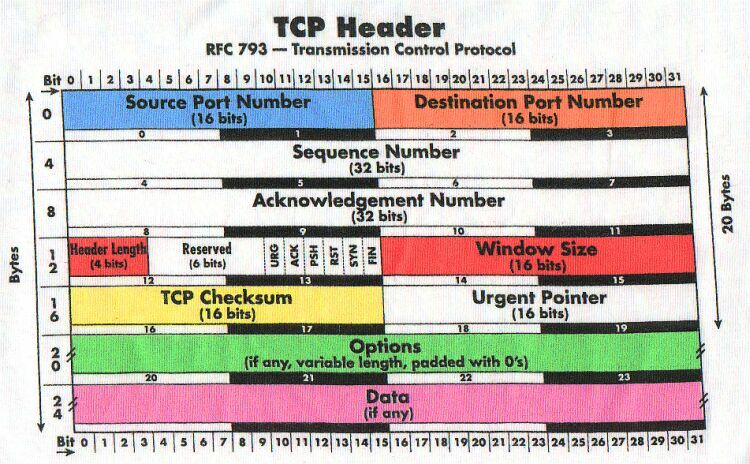 If TCP packet contains data then yes they follow TCP header.